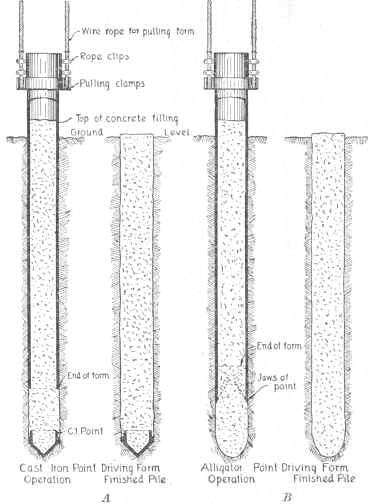 Uncased cast in situ piles are used where the ground does not disturb the pile hole with soil or water falling in it. They are cheaper than the cased piles but not as much as efficient than cased piles. Skilled workers are required to install uncased cast in situ piles. The main disadvantage with these piles is no inspection is possible after the installation. The advantages are storage space is not required and special equipment is not needed. Simplex pile is useful for both soft and hard soils. 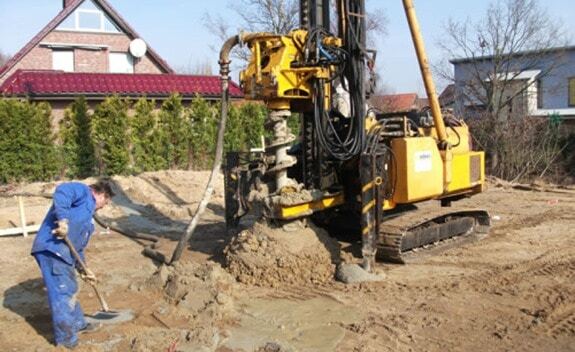 To obtain simplex pile, a steel tube with cast iron shoe is driven into the ground up to desired depth. After that, reinforcement is provided in the tube and then filled it with concrete. Then, the tube is slowly removed and cast-iron shoe is left at the bottom. So, for each pile new cast iron shoe should be attached. To overcome this, cast iron shoe with alligator jaw point is provided. Due to this jaw point, the shoe can be removed along with tube. The soil must be able to hold fresh concrete after removing tube. Frankie pile is suitable for granular type of soils and for soils bearing stratum of limited thickness is located at reasonable depth. This type of pile has mushroom shape bottom which acts like spread footing. 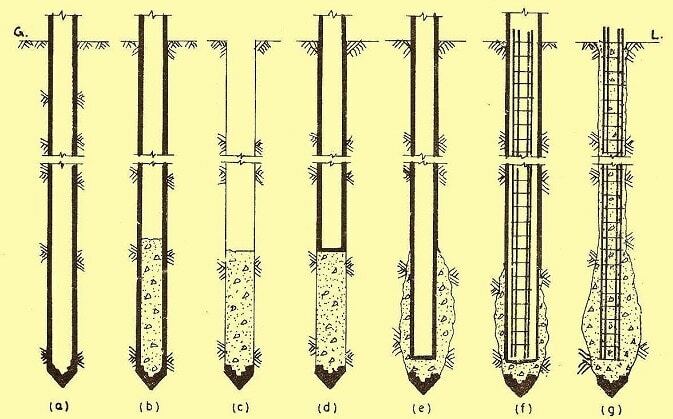 To construct a Frankie pile, initially a pipe shell consisting concrete or gravel at bottom is placed on the ground with the help of leads. Next, a drop hammer of 20 to 30 kN weight is dropped using diesel machines on the concrete bottom. Then the whole arrangement is driven into the ground. After reaching hard strata, the concrete bottom expands and gains mushroom like shape due to hammer blows. After that, some proportion of concrete is placed in the tube and ramming is done with hammer. Similarly, ramming is done for every 300-mm layer up to the top. If reinforcement is to be provided, then the hammer goes inside the reinforcement cage. Frankie piles can carry up to 900kN. Standard vibro pile contains same diameter all over the length. To install this, a steel tube attached with cast iron shoe is taken and driven into the ground. The driving is done by mechanical hammer of 2o to 25 kN weight. It blows from a stroke of 1.4 m height at a rate of 40 blows per minute. 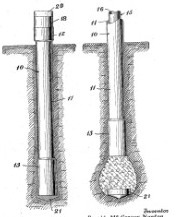 After reaching required depth, the tube and hammer are attached to extracting links. Concrete is poured into the tube from top and ramming is done by hammer at a rate of 80 blows per minute. While the concrete is filling, the tube moves upwards. The cast iron shoe remains at bottom of the pile in this case. Vibro piles can be installed in 35, 45 and 50 cm diameters up to a length of 25 meters and for loads of 600 to 700 kN. 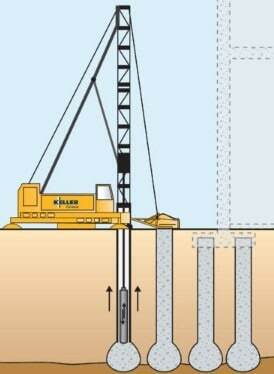 Expanded vibro piles are used when the depth of driving is limited or less than the required depth. In this case, the bearing capacity of soil can be increased by expanding the diameter of vibro pile. A steel tube fitted with cast iron shoe is driven into the ground. After reaching depth, the tube is filled with concrete up to some depth and tube is completely removed. Now flat shoe is attached to the bottom of tube and inserted in pile hole. This flat shoe makes contact with concrete and pushes it hardly. The concrete will be compressed and bulged or expanded like bulb shape. The tube with flat show penetrates concrete and forms deep hole in which reinforcement cage is inserted and finally this whole arrangement is filled with concrete after removing the tube. Expanded vibro piles are finished finally. Pedestal pile also featured same as Frankie pile. It is also suitable for soils containing limited thickness bearing stratum at reasonable depth. Pedestal piles also acts as spread footings. But in this case, steel core is used inside the tube for driving. After driven to the required level, the core part is taken out and is filled with some amount of concrete. Then, replace the core on the concrete and remove the whole tube and core suddenly with some pressure. This allows the concrete at bottom to expand and forms bulb like shape. This bulb is called as pedestal. Repeat the process until the top is reached. Finally tube and core are removed and pedestal pile is finished.